As one of the leading centers for music and culture in the US with more than its share of famous musical institutions, Boston has a plethora of talented musicians of national and international renown. Yet, it’s not every day that one encounters a musician with an unusual and diverse background as Mr. Chi-Sun Chan (陳志新). Mr. Chan is a well-respected conductor and music director of the Greater Boston Chinese Cultural Association (GBCCA) Chinese Music Ensemble and Youth Chinese Music Ensemble, with the former one being one of the oldest Chinese music orchestra in the New England area, featuring traditional Chinese musical instruments such as erhu, dizi, pipa, guzheng, yangqin, sheng, suona, etc. Like his name Chi-Sun, which means aspiring to something new, Mr. Chan has always looked for ways to innovate in every piece of music that he conducts, and challenged members of the ensembles to reach new heights in their performances. After Mr. Chan took over the conductorship in 2002, both ensembles have matured steadily year after year. The Youth Ensemble, in particular, has progressed and grown considerably under his coaching and nurturing. The ensembles’ directors, Tai-Chun and Tung-Mei Pan have nothing but praise and appreciation for Chan. “The conductor is the soul of an ensemble.” said Pan, “For the past 10 years, he continuously strives to produce the best quality music by challenging the ensemble members, raising the standard and improving the overall quality of the ensembles. He pushes the members to advance, but according to their capability. He can be demanding at times, but leads with humor, and makes the rehearsals interesting and fun.” Pan continued to point out that the young musicians in the Youth ensemble not only have full respect for him, but also welcome his challenges, and thereby are more willing to accept most performance opportunities throughout the New England area. It is important to add that Chan has also served as mentor to one of these young musicians. Muhan Zhang, currently a Sophomore at Boston College and a long time member and erhu player of the GBCCA ensembles during his high school years, can certainly attest to that. “I can firmly state that Chi-Sun Chan is an exemplary conductor, mentor and friend” said Muhan, “our relationship changed when, in my junior year, I asked him and his wife to help me prepare for a high profile music competition – The Fidelity FutureStage (now renamed The Young Artists Competition). I began seeing him two to three times weekly as he helped me prepare for my audition. Not only did he warmly welcome me as I repeatedly disrupted his peace at home, but all the while we slowly found ourselves talking more about the ideas that the music grew from… As an expatriate himself, Sun is gifted with both the personal experience and dedication that have propelled him to excel in eastern and western music. Ultimately however, it is Sun’s inherent nature and good will that makes it both a pleasure and an honor to work with him.” Thanks to Chan’s encouragement and valuable mentoring (aside from the young musician’s own dedication and determination), Muhan won Boston’s Fidelity FutureStage competition in 2010 and as a result got to perform with the Boston Pops. He was also invited to give a talk on the history of erhu for TEDxBoston. It is no wonder that under Chan’s coaching, artistic vision and strong leadership, the ensembles consistently give outstanding performances at their annual concert. They fluently interpret each piece of music with subtleties, nuanced with precise tempo and dynamics, which always earn some enthusiastic and appreciative applause from the audience. Here’s the catch: Chan’s background is in western classical music. He received his Advanced Diploma and Professional Diploma from The Hong Kong Academy for Performing Arts, his Master of Music from the Boston Conservatory, and his Doctor of Musical Arts from Boston University, majoring in tuba! As a tuba player, he has performed with such reputable orchestras as the Hong Kong Philharmonic Orchestra, the Hong Kong Sinfonietta, the National Taiwan Symphony Orchestra, the Civic Orchestra of Boston, and the Hingham Symphony Orchestra (now known as Atlantic Symphony Orchestra). He is currently a member of the Concord Band, the Concord Orchestra, and the Waltham Symphony Orchestra. Besides concert tours to Japan and Taiwan, his concert appearances include Carnegie Hall, Kennedy Center, Boston Symphony Hall, Hong Kong Cultural Centre and the National Concert Hall of Taiwan. So, was it fate or coincidence that he became the conductor and music director of the Chinese Music Ensembles? Perhaps neither. His wife Shin-Yi Yang is a musician and teacher of the Chinese instruments guzheng and guqin. In 2001, along with the help of his wife, he researched Chinese music and culture and gave his first Chinese music lecture in a world music class taught by Professor Lisa Urkeich at Boston University. He received very positive feedback from Professor Urkeich who then encouraged him to continue on the Chinese music study. The following year, Yang was invited to perform a guzheng piece with the GBCCA Ensemble. When the conductor at the time wasn’t available, Yang suggested Chan filling the conducting position since he had previously served as a band director while working in Hong Kong and Taiwan. The collaboration was quite successful, and the ensemble members were more than impressed. And as they say, the rest is history. In addition to performing tuba with the bands and conducting the Chinese music ensembles, Chan has also given music lectures at various colleges such as Harvard University, Boston University, Wellesley College, Berklee College of Music, and Lasell College. 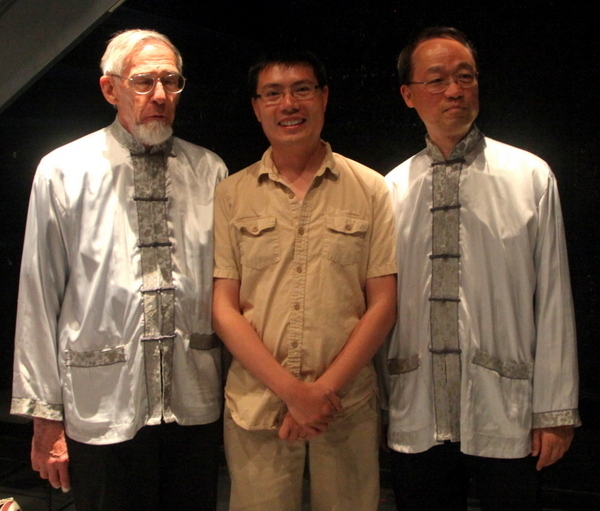 Chan has recently given a lecture series on western classical music at GBCCA to promote music appreciation. His most recent lecture on “Contrasting Chinese music with western music” (“中西音樂文化比較”) drew the largest crowd. There, he shared his perspectives, highlighting the difference and individual strengths of both eastern and western music. The advice he concluded with was “not to listen to nor judge Chinese music through the ears of a western perspective”. For the past year or so, Chan also teaches percussion at Lexington Chinese School, Tzu Chi Academy, and Huaxin School of Arts. Q. When did you start playing tuba? There are so many instruments to choose from, how did you decide to take up tuba? A. My best friends in Junior High were members of the school band. I wanted to join the band so that we could hang out together. But I warned them that I would take up any instrument except the tuba that’s too big and too heavy. So, they introduced me to the band director who immediately designated me to play the tuba – the largest and lowest-pitched brass instrument (that usually serves as bass in the brass section) – due to my physical attributes. Notably I was taller than everyone else in the band. I honestly believe that the hidden reason was that the brass section was in dire need of a tuba player at the time! But I fell in love with the instrument and stuck with it throughout high school, which actually propelled me to pursue my higher education in music. I was accepted in the Hong Kong Academy for Performing Arts, and was very psyched when I was already assigned a pianist to accompany all my solo performances in my freshman year! Q. Do you have a favorite musical period and a favorite composer? A. Well, I could be bias since I play the tuba. My favorite musical period is the Romantic period since the tuba was one of the most recent additions to the symphony orchestra, first appearing in the mid-19th century. My favorite composer is Wagner who’s also a great conductor. Several of his compositions include some well-known and influential parts for the tuba. Q. What do you like best about performing? A. It’s exhilarating when the audience enjoys the performance. But I thoroughly enjoy the teamwork while being an individual contributor of the orchestra. It’s also very gratifying when the conductor has full trust in me or acknowledges my tuba playing skill or appreciates my participation in the band. Q. What do you like best about conducting? A. Needless to say, it’s very satisfying when the audience responds enthusiastically. Being a conductor also gives me a chance to share my musical ideas with the ensemble members. Conducting requires the ability to communicate nuanced phrasing and musical expression effectively to the ensemble. And the conductor has to listen critically and shape the sound of the ensemble in order to control the interpretation and pacing of the music. I thoroughly enjoy this responsibility! Q. What was the transition like for you from playing a western instrument (being trained in western classical music) to conducting Chinese music ensembles? Was it a smooth transition? Or did it take some adjustment? 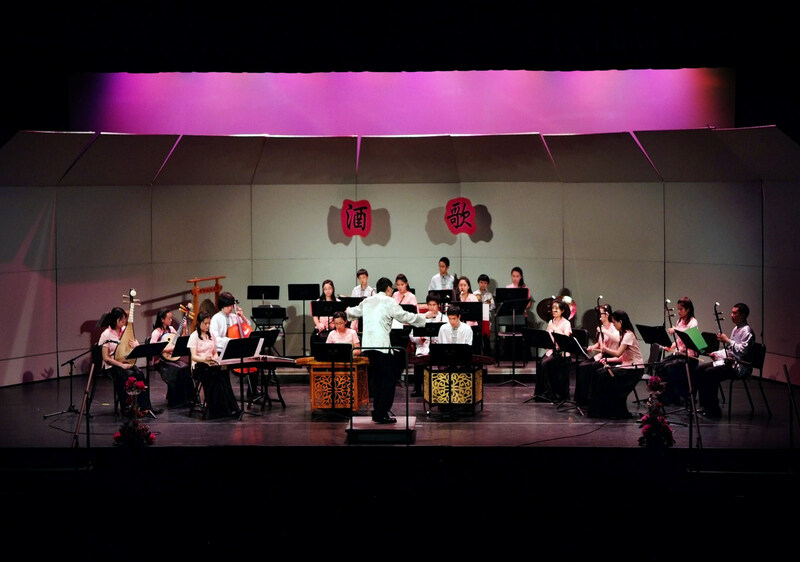 A. I first started conducting the GBCCA Chinese Music Ensemble in 2002. Before that I only had experience in conducting western music bands. So, conducting a Chinese music ensemble was a challenge and wasn’t natural for me. I remember in the beginning, some of the music the ensemble played didn’t even have a full score. In order to conduct the pieces, I had to rely most of the time on the dizi and erhu parts of the music score since they usually hold the main melody. Some of the music scores were not complete or some were so faded that I couldn’t really see what was written. I also had to learn the standard seating arrangement in a Chinese ensemble so that I wouldn’t give a cue to the wrong player! On top of that, I wasn’t familiar with the cipher notation (jianpu or numbered notation) used in Chinese music scores, although I feel comfortable with it now. We also tend to use both kinds of notation nowadays: the numbered notation and the western staff notation. Q. What is the most challenging aspect of being a Chinese music ensemble conductor? A. I have to be able to communicate effectively the elements of musical expression to the ensemble. Since many of the ensemble members are not professional musicians, I have to also play the roles of a coach and musical director. So, I have to learn to be very patient and nurturing, especially to our young members. But I welcome and fully enjoy the challenges. Q. Do you have any memorable moments you would like to share? A. In 2004, we decided to record our first professional CD to celebrate the Chinese Music Ensemble’s 20th anniversary. And we had to line up the CD release date with the date of the ensembles’ annual performance. So, all the ensemble members were literarily locked up inside the recording studio for 2 solid days! Everyone was thoroughly exhausted by the end of the recording sessions! But we were more than thrilled with the final result – which is the release of the ensembles’ very first recording album! Q. In your opinion, what is the difference between Chinese and Western music? A. As a Chinese music ensemble conductor, I think the difference between western and Chinese music lies in the sound they produce and the texture of the music. The sound of traditional Chinese musical instruments is very different from that of the western instruments. The sound of the dizi and the erhu for example is not like the sound of their western distant relatives – the flute and the violin. On the other hand, the sound of the Chinese percussion has a lot more tonal color than the western percussion. I think the sound of a Chinese ensemble is so unique that it can never be reproduced by western ensembles. The texture of Chinese music is more linear and simple. So it is easier to appreciate when compared to the music of Bach or Mahler for instance. It is more common for Chinese music to use tunes that were drawn from folk or traditional melodies. Unlike western music, traditional Chinese music always comes with a descriptive title or a story behind the music. Instead of using the western classification of “symphony”, “sonata” or “concerto”, traditional Chinese music uses descriptive common names for music titles such as “Fisherman’s Song of the Eastern Sea”, “Joyful Songs from the Water Village”, or “Lantern Festival”, etc. Q. What are your goals as an artist/musician? A. I don’t have a particular goal. But I do hope to be able to continue collaborating with other Chinese instruments and musicians. In 2003, I had a great opportunity to collaborate with my wife and arranged a musical piece called “Guzheng Suite” for tuba and guzheng. I then presented a lecture recital entitled “Chinese Music Transcribed for Tuba and Guzheng” at the Northeastern Regional Tuba Euphonium Conference at University of Massachusetts. The “Guzheng Suite” that my wife and I performed at that recital was later recorded by my former professor John Manning in his first solo album “Four Corners” that was released in 2009. So, I hope I’ll have a chance in the future to collaborate with musicians from other traditions and to arrange musical pieces that incorporate my tuba playing with other instruments.